There are a number of alternatives when choosing a set of components to drive an LED matrix. The controllers can be chosen from a variety of embedded devices, Arduino or otherwise, and the strips, such as WS2812B vs APA104, can be selected to optimize for cost, speed, or color. In one of my first attempts at building with WS2812B strips, I worked with Kirill Shevyakov, Alex Savich, and Fixx Invictus to construct some columns housing WS2812B strips controlled through a wired connection to a FadeCandy. In a follow up project, based on design guidance from Leo Villereal and the other founders of Disorient, we worked with Viktor Getmanchuk and Jason Cipriani to build the Disorient sign for Burningman. Content for the sign is generated in Processing, and a single Beaglebone Black drives the entire matrix. 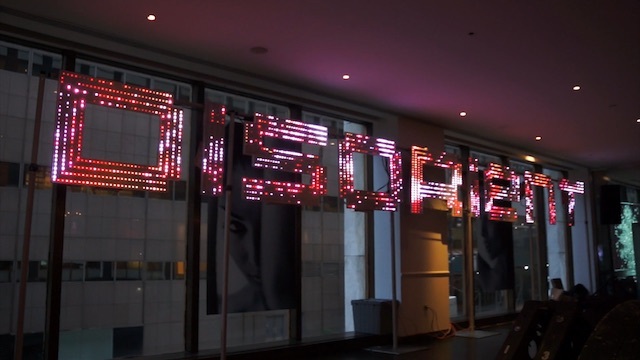 The Disorient sign has since been adopted by the fine folks at NYC Resistor. They provided the really awesome power and communication distribution boards in the initial build. Mobile devices such as the iPhone are fast enough to drive displays like an LED matrix interactively. One early bottneck to overcome is solved by choosing the right communication protocol and network hardware. Color information for a single light is typically four bytes that can be sent to a device communicating via Serial, TCP/IP, UDP or other protocols to a microcontroller driving the LEDs. Latency can be reduced by working with a fast router. After several attempts of trying out different protocols, I discovered that the MQTT protocol can support delivering brightness values with low latency to a lot of nodes. In order to test the protocol, I built a coffee table from some white APA104 strips embedded in plexi tubes and diffused with some custom cut plexi panels. The content for this table was generated in a SceneKit instance on an iPad, sampled from the framebuffer, sent wirelessly to a router connected through ethernet to a Teensy 3.2 microcontroller. 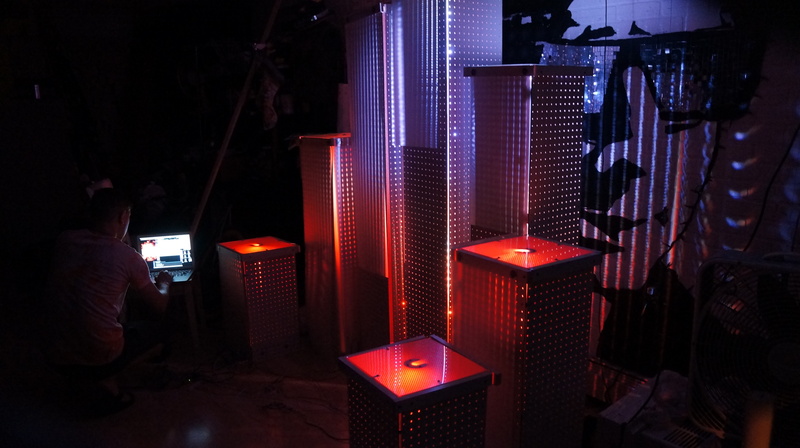 In the video below, the iPad’s test software drives the diffused LED matrix. The coffee table was a proof of concept for using an iPad to drive ambient displays. This project will fold back in to an exploration of volumetric displays in order to drive the displays wirelessly from roaming depth cameras such as those in the iPhone X.